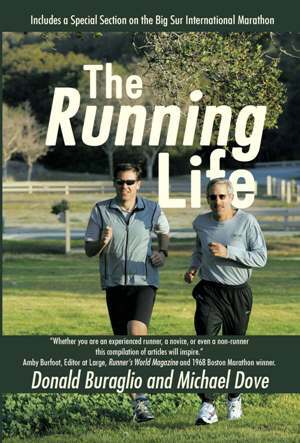 The Running Life: Who Won? We often make fun of sports like gymnastics and figure skating where victors are determined by judges. There are no style points in running, and the first person to reach the finish line is the winner … right? Surprisingly, it doesn’t always happen that way. Age group road racing may be the only sport where you don’t know who your rivals are, or where they might be on the course. Heck - even in competitions where napping is commonplace, such as the Iditarod dogsled race or multi-day boat races, you’re usually aware of your competitors’ relative standing. In running, sometimes you don’t know these things until the race is over – and even then, it still might be a mystery. We were reminded of this after last fall’s Big Sur Half Marathon, where Mike was engaged in a battle he thought he won, only to realize that wasn’t the case. After pushing the pace for the first 10 miles, Mike was unexpectedly passed at mile 11 by a runner that looked old enough to be in his age division. He courageously hung with the challenger for 2 more miles before summoning a furious sprint in the homestretch, ultimately passing and beating the other runner by 3 seconds. It wasn’t until the award ceremony that Mike realized that his heroics were for naught; because the race was chip timed, each racer’s overall time was calculated from the time they crossed the start line. As it turned out, the other runner had crossed the start 5 seconds later than Mike – giving him a victory over Mike by 2 seconds. It wasn’t the first time Mike was on the wrong side of a chip controversy; one year earlier at the San Francisco Marathon, he entered the day before the event, placing him in the 10th starting corral. In a race of 20,000 runners, the start is controlled by having corrals of 1,000 runners begin at two-minute intervals to ease congestion on the course. The race used microchips so each person received an accurate time from the starting mat to the finish line, and Mike ran 12 minutes faster than anyone else in his age group. Naturally, he should have won – except that at San Francisco, age group awards were based on gun time, and some of the runners with 20-minute head starts crossed the finish line ahead of him. In that same race, the woman who crossed the finish line first overall wasn’t declared the winner, and didn’t receive the prize money she had earned. Race organizers ruled that since she didn’t declare herself an elite runner before the race started, the other top runners didn’t recognize her as a competitor. Clearly, it was a strange day all the way around. To their partial credit, race organizers eventually awarded the first female her winnings, but Mike’s age group situation was never remedied. Such problems would be eliminated if everybody clearly knew who they were competing against. To improve visibility in competition, USA Track and Field now requires runners in championship races to wear bibs on their back indicating their age group. Triathletes have done this for years, as part of the pre-race check-in process is to have your age group stamped on your calf muscle. Until all road races adopt similar policies, the best you can do to avoid this controversy is to and know the rules of competition for each particular race. And of course, if you’re going for an age group award, it always helps if you can train hard and run extremely fast. I can see the pro and con to having it both ways, but I think having the race chip-timed is a necessity. Most people behind the top 100 or so are just there to run the best they can, regardless of how others are running, and they want to know how long it took for them to run the actual course. If you see it as a true "race to the finish" then it's important to make sure you migrate to the appropriate spot near the start line so you can run with those close to your skill level. While this won't solve the problem 100%, it is probably the best you can do! All the races I've done use gun time for age group and overall awards, which to me makes sense. For those awards, you should be actually racing people near you. They use chip timing for qualifying for various other races, or the next year's corrals. This system seems to work pretty well.